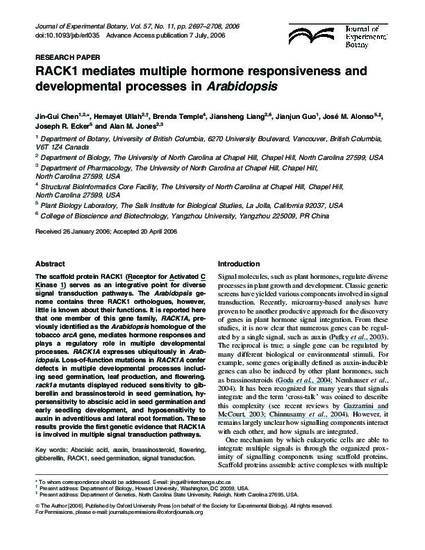 of this gene family, RACK1A, previously identified as the Arabidopsis homologue of the tobacco arcA gene, mediates hormone responses and plays a regulatory role in multiple developmental processes. RACK1A expresses ubiquitously in Arabidopsis. Loss-of-function mutations in RACK1A confer defects in multiple developmental processes including seed germination, leaf production, and flowering. rack1a mutants displayed reduced sensitivity to gibberellin and brassinosteroid in seed germination, hypersensitivity to abscisic acid in seed germination and early seedling development, and hyposensitivity to auxin in adventitious and lateral root formation. These results provide the first genetic evidence that RACK1A is involved in multiple signal transduction pathways.